They Like You, They Really Really Like You! 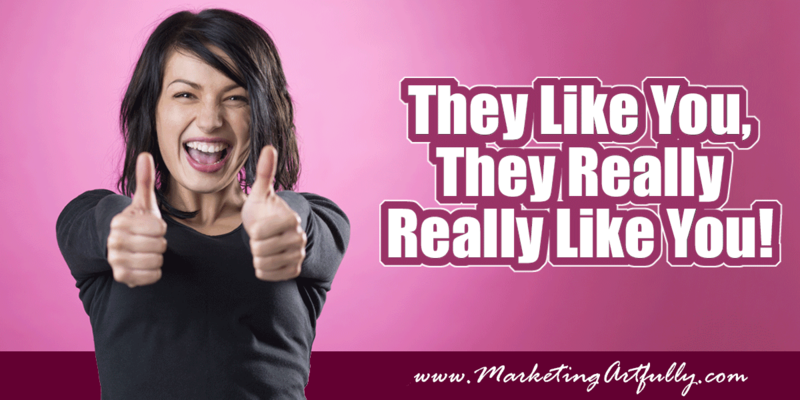 You are here: Home / author marketing / They Like You, They Really Really Like You! Have you ever stumbled across someone on a Podcast, on their website or at an event and just totally became enamored of them? You heard them speak, saw them on a video or read their book and BAM it hit you, I totally dig them! THAT is what everyone talks about when they say you need 1,000 True Fans! You need to make sure that the people who need your message can find you and that you are providing content, coaching and courses that will help them! There I said it! I have no problem proclaiming loudly from the rooftops (and on my Twitter stream) that there are amazingly interesting people who I follow (stalk) online. Dori Clark is a new “love” of mine. She is promoting a book she just wrote called Reinventing You and I “met” her on John Lee Dumas’ Entrepreneur On Fire Podcast. The neat thing about this is that I don’t really need her book. I am really clear about what I want to do (marketing) and who I want to do it with (rebel entrepreneurs, realtors and writers). But that didn’t matter! I LOVED her message and something in the interview must have struck a chord with me because I have gone on to watch her TED talk, listen to other podcasts she was on and joined her email list. In fact, she is in this post because she sent me an autoresponder message this morning and I was happy to get it. Yep, I was super happy to get an automated email from someone I like. I know she didn’t send it just to me, but it was helpful and I loved the content. I have been working on my autoresponders lately and thinking, this is pointless. I have heard that autoresponders are stupid and kind of think that myself, until this morning. This morning I am fired up to get in there and help MY true fans with messages that are amazing too! So I was at a conference a couple of weeks ago and met a gal there who didn’t annoy me. She has a REALLY big personality (like I do) and is loud and opinionated (like I am) which usually rubs me the wrong way. But not Honoree! We clicked like peanut butter and jelly! She taught me a cool little acronym, PLUs…people like us! She would fit in great with my merry band of strong, smart and powerful women friends! I could definitely have a drink with her and talk about marketing which is the highest compliment I can give a human being. It is weird when you find someone like this, almost like you have been friends forever even if you just met them. THAT is what people who fall in love with you will feel like. You are a “people like them” and they want to get to spend time with you by buying your books, courses or coaching! I love, love, love Gary Vanerchuk! I met him years ago in a room of just 75 people when his very first book, Crush It, came out. I have watched all his keynotes, bought all his books (in hardcover and audio form) and look forward to getting his almost daily webcast. There are a lot of people who object to Gary’s cussing during his keynotes, but I don’t care. When he had a popular wine review show, he spit into a Jet’s bucket which his “Vayniacks” loved and which drove the wine snobs absolutely insane. As long as you stay true to yourself, people who are your fans will forgive anything. They will love you and your message, and not be judging you for every little thing that goes wrong. For example, I just recently got a message from a fellow who had read one of my Realtor books and the link to the free offer wasn’t working. He wasn’t mad, just sad he couldn’t get to it. I hooked him up and he went on to buy ALL my Realtor marketing books and signed up for one of my marketing mini courses. If you have someone who really, really likes you and your message, they look for the good in all the problems rather than trying to find fault in everything you do! I think this one was the hardest for me to get over. I have a bunch of content out there online and don’t have as many haters as some people do, but they are there! They leave mean reviews on my books, call my emails spam and generally make me glum. I tended to listen to them more than all the other people who were saying nice things and it made me a little hesitant to try new things. But if you are only making products and services for true fans, almost all of that goes away. They are looking for reasons to help and support you, not tear you down! Do you have a favorite author? Have you read ALL their books? Did you ever think that, “hey I read one of them, I am all set now!” Nope…you wait eagerly for their next book to come out. Making new products and services for your fans is like that. You know that they want more content to help them and it is your JOB to write more books, make more courses, offer coaching and anything else that you like to do that can help them. We often feel that we are “bothering them” or that they can get all that for free on the internet, but they 1) can’t get it in an easy format and they 2) can’t get it from you! I am sure there are millions of people who sell marketing courses, but there is only person who can do them the way I do…ME! If you have read this far about authority marketing you might be like me…needing a little boost of confidence from time to time! If so, check out our book, Fearless Marketing For Women. It is an easy read and will help scare away those boogie men in your head!